Wu Bin, the famous martial master and a ninth grade member of the Grading System of Chinese Wushu, was born in Huzhou city, Zhejiang province. He has been taking the posts of Director of the International League and Asia Wushu League, general coach of Beijing Wushu Team, and is regarded as one of the most outstanding coaches of Chinese Wushu Association. With rich experience about international communication and teaching, he makes great contribution to the promotion of Chinese Kungfu. Times without number he led the Beijing Wushu Team to participate in the tournaments and got excellent scores. 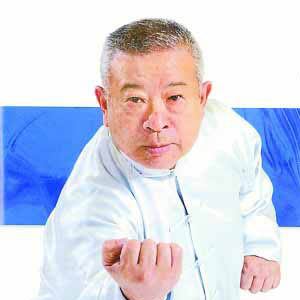 What’s more, he taught and brought up a large number of world-famous kungfu stars such as Jet li, Wang Qun, Kou Zhanwen and so on. He also occupied as the general coach and referee for many world-grade tournaments. With so much glory, Mr. Wu Bin is praised as a guide for the progress of Wushu and ambassador for the transmission of culture.